A week or two ago, I got a package in the mail from Vu. In it were two CD’s for review, and due to illness, and being really busy with other things, I kinda ended up sitting on ’em for a while. One of them caught my eye instantly, and I decided that that’s the one I’m going to be talking about first. 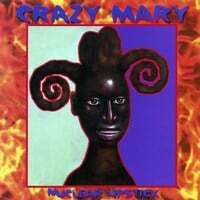 Nuclear Lipstick by Crazy Mary has an album cover that can only be described as bizarre, in that “90’s throwback” sorta way. It could probably be mistaken for a bad post-grunge CD based on the cover alone. Fortunately, that’s not at all what we have here. Honestly, I’m not quite sure what to make of Crazy Mary in general or Nuclear Lipstick in particular. The dreamy Moving In Space seems to go on for hours (but actually clocks in under four minutes). Damn Good…isn’t, but it’s not bad, a somewhat discordant, druggy, slow-paced instrumental that starts off in the middle of nowhere and pretty much stays there. For some reason it brings to mind a trip down a two lane road about seven miles off of I-59 through Mississippi. Even when the band rocks out, on That Same Old Feel Once Again it’s difficult to get a handle on what they’re doing; think Chuck Berry meets Jonathan Richman. And The Promise sounds like The Fugs, off of one of their ESP Disk releases. That, of course, is a compliment.Mistake Number Five, another instrumental, sounds at times like the droning of an intergalactic refrigerator, but at the same time is kind of cool as well. The title of the closing track, Woke Up Mixed Up, really sums things up nicely. And yet…I keep listening over and over to The Dolphins Are Swimming, yet another instrumental — too short, by half — which vaguely reminds me of The Garden Is Open by The Fugs.